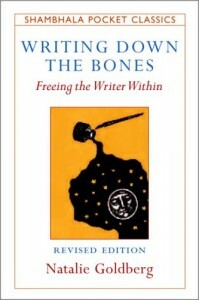 Today I emailed someone and recommended to them this book called “Writing Down The Bones” by Natalie Goldberg. My copy is small and fat – slightly bigger than the size of my palm, but it is the full edition of the book. WDTB is not a “how to” book about creating characters, plot or character arc or anything like that. It’s far more personal than that – it’s about looking after yourself as a writer – no matter what stage of the journey you’re on. Ms. Goldberg is tremendously funny and charming throughout and the advice is solid, backed up by many many years of experience both as a writer, poet and tutor. What I like about it too is that the chapters are short and quick reads that you can flick through for a bit of inspiration. Or, if you’re keen, you can really dig deeper and figure things out. There are no exercises to do, it’s just a conversation between you and the writer. I like that too. I’m not good with doing exercises that come part and parcel with a lot of “how to” books. I kick against them, but so enjoy doing them in Real Life when it comes to SCBWI Masterclasses. I think I need a Live Person hurrying me up and along. What I’m really saying here is: if you feel yourself flagging, of if doubt’s rearing it’s ugly warty head, Writing Down The Bones is a great book to dip into, to put you back in touch with your creative self. She’s tough, too, this Ms. Goldberg, so don’t think you’ll just be mollycoddled. She speaks a lot of sense.